Angry protesters storm Iranian consulate in Basra amid demonstrations that have turned deadly in the past few days. 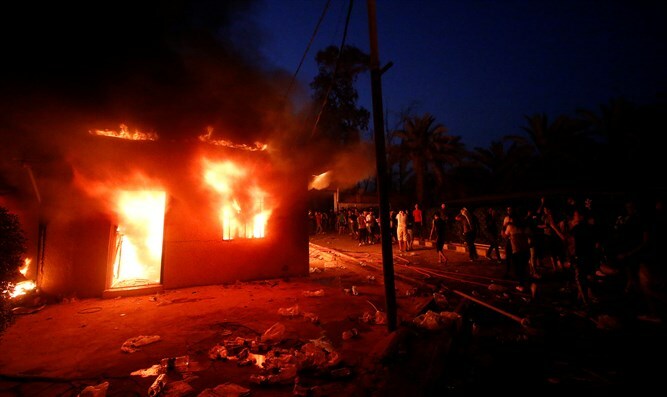 Angry protesters on Friday stormed the Iranian consulate in the southern Iraqi city of Basra, setting a fire inside as part of ongoing demonstrations that have turned deadly in the past few days, a security official and eyewitnesses said, according to The Associated Press. The protests in Basra and other cities, the most serious to shake Iraq's oil-rich southern Shiite heartland in years, have since July been calling for an end to endemic corruption, soaring joblessness and poor public services. Clashes erupted earlier this week, leaving several civilians and police dead. Prime Minister Haider al-Abadi has ordered an investigation into the violence which shows no sign of abating, noted AP. The violence prompted the temporary head of Iraq's parliament, the eldest lawmaker, to call an emergency meeting on Saturday to discuss the protests. The protesters shouted anti-Iranian slogans outside the Iranian consulate Friday evening, including "Iran, out, out!" before they stormed it and set a fire inside. Smoke could be seen rising from the building. Protesters also burned an Iranian flag. Many residents of the predominantly Shiite city accuse Iranian-backed political parties of interfering with Iraqi politics. Iran's foreign ministry spokesman, Bahram Qassemi, condemned the attack on Iran's consulate in Basra and said none of the staff have so far been hurt. He added the attack caused significant damage to the consulate building, and called for maximum punishment for the assailants. Just last week, the Reuters news agency reported that Iran had transferred short-range ballistic missiles to its Shiite allies inside Iraq in recent months. Iraq’s Foreign Ministry said the article was “without evidence”, though it stopped short of denying its contents.